The field of human genetic engineering is on the brink of changing the world. But how did it get to this point, and what does the future hold? In her new series, Allegra Chatterjee delves into the past, present and future of genetic engineering. Part 1 examines the history of genetics, taking us from the discovery of the structure of DNA to glow-in-the-dark pigs. The field of human genetic engineering is teetering on the edge of a precipice. With the development of the revolutionary new gene editing technology, CRISPR-Cas9, a steep jump (or fall) into the thrilling yet unpredictable unknown is inevitable, as novel types of genetic manipulation never before possible are now within reach. While this has drastic and exciting implications for treating some of the world’s most devastating disorders, new advances inevitably bring with them a heavy load of ethical, political and legal baggage. Can looking to the past help us make sense of the present, and help to guide us when navigating the uncharted scientific territory of the future? The human fascination with manipulating our own biology has long been evident in popular culture. The term “genetic engineering” was first coined in the 1951 science fiction novel, Dragon’s Island, two years before the structure of DNA was even discovered, and it has been explored more recently in films such as the 1997 film Gattaca and the Hollywood X-Men franchise. However, the fantasy is gradually becoming a reality. To understand genetic engineering, we first have to understand genes. The entire complexity of life on earth (and possibly elsewhere) is dictated by deoxyribonucleic acid (DNA), using just four letters, known as “bases” – adenine (A), thymine (T), cytosine (C) and guanine (G). The only known exceptions are some viruses, which use uracil (U) instead of T.
Often referred to as “the blueprint of life”, the genetic code contains instructions, much like a computer code, although instead of making an internet page or app, it details how to make a living organism. Each set of three bases (e.g. GAT) in an organisms’ DNA, which in humans is 3 billion letters long, codes for the production of one amino acid. Different combinations of amino acids generate different proteins, therefore sections of DNA and the combinations of bases they contain give rise to the enormous multitude of proteins that make up an organism, be it a protozoa, plant or pig. These sections, which each code for a different protein, are known as genes. Genetic engineering is the process of altering an organism’s DNA using biotechnology. Using a variety of laboratory techniques, genetic engineering can be employed in a range of diverse ways, including deactivating genes (which prevents the production of proteins), increasing a gene’s activity (generating more of a protein), and transferring genes across species boundaries to create entirely novel organisms (e.g. glow in the dark pigs, created by transferring genes for green fluorescent protein from jellyfish into, you guessed it, pigs). 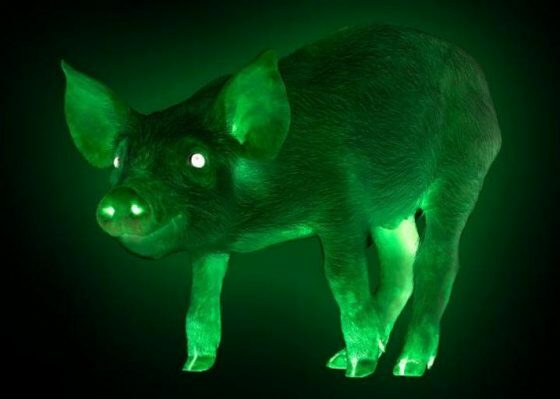 Creating a glow in the dark pig, or other transgenic organisms (one whose genome has been altered by the transfer of genes from another species) is a surprisingly, if slightly unnervingly, simple process. It involves harnessing several naturally occurring enzymes produced by microorganisms, to cut out and stitch together DNA from different organisms. This creates what is known as recombinant DNA, which can then be inserted into another organism to create a transgenic organism. A commonly used method involves using microorganisms as “vectors” to transport DNA from one species into another. 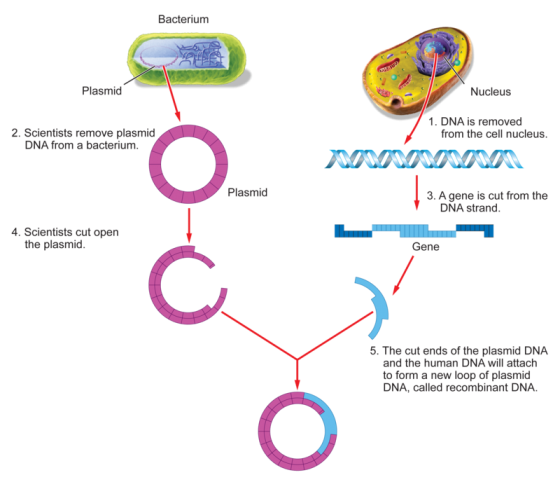 First, circular pieces of DNA known as plasmids are extracted from bacterial cells. The gene of interest is isolated from the genome of the organism in which it is naturally found; in this case the green fluorescent protein (GFP) gene from jellyfish. An enzyme is used to cut both the plasmid, transforming the DNA loop into a string, and the GFP gene, from the jellyfish DNA. Another enzyme is used to fuse the two pieces of DNA together, re-creating the circular plasmid, but crucially this time with the GFP gene inserted. The new GFP-containing plasmids are then injected into developing pig embryos, where the jellyfish gene nestles itself into the pig’s genome. That embryo eventually develops into a glow in the dark pig! The same technique, or variations of it, have been used to create a menagerie of glow in the dark animals, including cats, fish, monkeys, and the famous example of Alba, the fluorescent rabbit engineered by scientists for contemporary artist Eduardo Kac. No humans yet, but in theory they could be created, and similar techniques using different genes could be used to bestow on us all manner of attributes à la X-Men. The technology is here, but how did we get to this point? The first significant step along the journey towards genetic engineering was taken in 1953, when the mystery of the structure of DNA was finally solved by Rosalind Franklin, James Watson, Francis Crick and Maurice Wilkins; a landmark discovery which won them the 1962 Nobel Prize, with the exception of Franklin due to her untimely death in 1958. 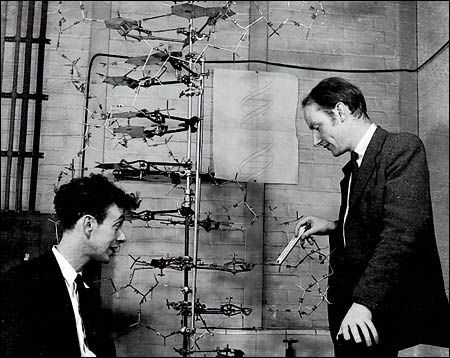 However, despite the milestone discovery of DNA’s structure, the genetic code was only deciphered thirteen years later in 1966. Like deciphering the Rosetta stone, cracking the genetic code was pivotal, allowing us to read and understand DNA for the first time, and opening up the possibility of rewriting it. Although humans have been shaping organisms’ genomes for thousands of years through selective breeding, direct manipulation of genetic material only began in 1972, when Paul Berg made the first recombinant DNA. Berg’s novel creation contained genetic material from two different species – the lambda virus and the monkey virus SV40 – marking the beginning of a new era in the field of genetic engineering, sending tremors of wonder and anxiety through both the general public and scientific community. Just one year later in 1973, scientists created the first transgenic organism by inserting genes for antibiotic resistance into a plasmid of an Escherichia coli bacterium. In 1974, the first transgenic animal was created, when Rudolf Jaenisch introduced foreign viral DNA into a mouse embryo. By the 1990s, hundreds of transgenic mice strains had been created in labs around the world. These landmark discoveries of the 1950s – 80s opened the door to the exciting possibility of curing some of the world’s most devastating diseases, such as cystic fibrosis, Huntington’s disease, and sickle-cell anaemia. Genetic diseases such as these are caused by mutations, or variations, in the DNA of specific genes, arisen spontaneously by random chance, or inherited from one or both parents. Some, including cystic fibrosis and sickle-cell anaemia, are caused by an alteration of just one letter out of the 3 billion letter long human genome. Mutations can cause disease by leading to insufficient amounts of the protein the gene encodes (as with cystic fibrosis), or generating malformed, contorted versions of the normal protein (as with Huntington’s and sickle cell). 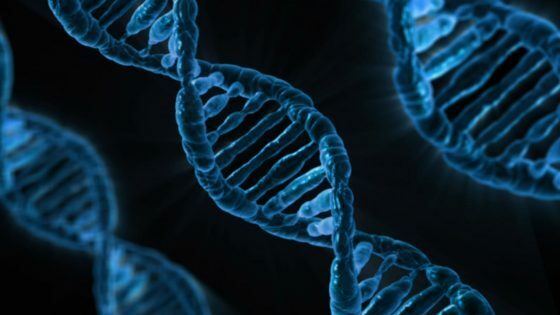 If biotechnologies could be harnessed to re-write DNA by delivering working copies of mis-spelled genes into the genomes of people with malfunctioning or non-functioning versions of those genes, the medical implications would be unparalleled; this is the aim of gene therapy. It should be noted, however, that the most significant medical application of recombinant DNA technologies to date has been its utilisation to produce biological substances. One of the most famous and wide-reaching examples is insulin required by diabetics to regulate blood-sugar levels, which until the advent of genetic engineering was produced by mashing up the pancreases of pigs, and extracting and purifying insulin from the resulting soup. In 1978, the biotechnology company, Genetech, produced the first biosynthetic ‘human’ insulin, safely and cheaply in large quantities, by inserting the human insulin gene into plasmids of Escherichia coli bacteria, revolutionising the treatment of the disease. Since then, countless disease treatments have followed. However, this form of treatment, although powerful, is not a genetic ‘cure’ as it merely treats symptoms and does not change the genome of those suffering from disease. The application of the exciting new genetic technologies developed throughout the 70s and 80s culminated in 1990, when six-year-old Ashanti DeSilva became the first ever human to be ‘treated’ using gene therapy. Throughout her childhood Ashanti was plagued with variety of unusual ailments, which her puzzled doctors could not explain. At the age of 3, her condition was attributed to a rare spontaneous genetic mutation in a gene called adenosine deaminase (ADA). This gene encodes an enzyme that converts adenosine, a molecule naturally produced by the body, into a benign product. Without a working ADA gene, toxic by-products accumulated in Ashanti’s small body, poisoning her body’s cells, but in particular affecting her infection-fighting T-cells. With this crucial element of her immune system weakened, Ashanti was unable to protect herself from infections. T-cells were extracted from Ashanti’s blood and infected with a retrovirus carrying an inserted working copy of the human ADA gene. The infected T-cells were then injected back into Ashanti, with the intention that the new ADA gene would be present in the T-cells and would start producing ADA, counteracting her deficiency. Although not considered ‘true’ gene therapy as the new T-cells would inevitably fade from the blood over time and the effects would not be propagated through to subsequent generations, if successful the experiment would demonstrate that gene therapy was, in theory, possible and safe. Did the experiment work? No one knows. Although it proved that virus infected cells could be delivered safely into humans, Ashanti continued to be treated with medical ADA injections, therefore the results of the study were confounded. However, the promising early gene therapy experiments that continued to be carried out during the 1990s were abruptly called to a halt after the tragic death of 18-year-old Jesse Gelsinger in 1999. Like Ashanti, Jesse had a condition caused by a mutation in a single metabolism gene, called ornithine transcarbamylase (OTC), which codes for an enzyme critical for the breakdown of proteins in the body. Without it, the toxic by-product ammonia accumulates in the body, slowly poisoning many cells including neurons in the brain. By the time Jesse was a teenager, he had had several near-death experiences, including one at age 4 when eating a peanut butter sandwich had put him into a coma. This time the gene therapy experiment was even bolder – an adenovirus (also known as the common cold) carrying the OTC gene would be delivered into the body directly to infect Jesse’s cells in situ. On 13 September 1999, Jesse Gelsinger was injected with the concoction, surrounded by excited and hopeful doctors and scientists. But by the next morning Jesse had slipped into a coma, and four days he was pronounced brain dead. Jesse’s autopsy revealed a hyperactive immune response, likely related to previous exposure to the virus, which overwhelmed his body causing multiple organ failure. An investigation into the clinical trial itself revealed a series of blunders, incompetency, neglect and deceit, including the undeclared death of a monkey in an earlier stage of the trial, and the uncovering of the disturbing financial stake in the results held by one of the experiment’s principle scientists. Jesse’s death was ultimately caused by the corrupting effect of scientific and financial ambitions of the early gene therapy pioneers who promised to help him and others. The Jesse Gelsinger gene therapy trial and others like it carried out during the 1990s did not lead to a revolution in genetic treatments, failing to deliver on the therapeutic and financial promise that had been so eagerly anticipated. Jesse’s tragic story is etched into the history of genetic research, serving as a cautionary tale for scientific overreach and teaching the scientific community a harsh but necessary lesson by warning against the risks of hubris, enthusiasm and delusion. By the turn of the millennium, scientists’ and society’s high hopes for the extraordinary powers of gene therapy had been tempered. However, enthusiasm increased again with the completion of the Human Genome Project in the early 2000s, facilitated by the huge advances made in digital technologies. In Part 2, we will look at where these developments have taken us and at the present capabilities of human genetic engineering. Allegra Chatterjee works for the NHS as part of their Graduate Management Training Scheme, with a specialism in Policy & Strategy. Her current placement is with the NHS Innovation Accelerator, an organisation dedicated to faster up-take and spread of evidence-based medical innovations for increased benefits for patients, staff and the population. Before this, Allegra graduated from UCL with a BSc and MSc in Natural Sciences, where she majored in Genetics and minored in Organic Chemistry.